In business since 1977, Sol-Con Insulation Company has been a family owned and operated business for over 25 years. With the experience in blown-in cellulose insulation for new and existing homes, we use only the best materials and offer expert knowledge in the many different applications. Sol-Con Insulation is an authorized Nu-Wool WALLSEAL dealer. Nu-Wool Cellulose is the only insulation that is registered with the E.P.A as being a fungicide, which makes it resistant to the growth of mold or mildew. It also has been tested to be 40% better and more energy efficient than fiberglass. Nu-Wool Cellulose Manufacturing Company has been in existence for over 50 years. New homes that have Nu-Wool installed in them can receive a 3 year heating and cooling guarantee! Sol-Con Insulation's longevity is a testament to the level of service, trust, and quality of product you can expect when you choose an insulation company for your needs. 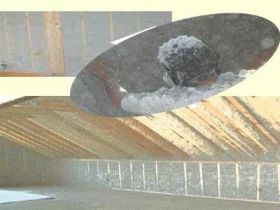 Sol-Con Insulation offers the highest quality of work at the most competitive prices. We are "Insulation Management Specialists." "The water pipes are frozen!" "This house is too cold!" "The heating and cooling bills are too high!" "There's ice damming on the roof!" "There's mold in my house!" "Well you're the builder. What are you going to do about it?"